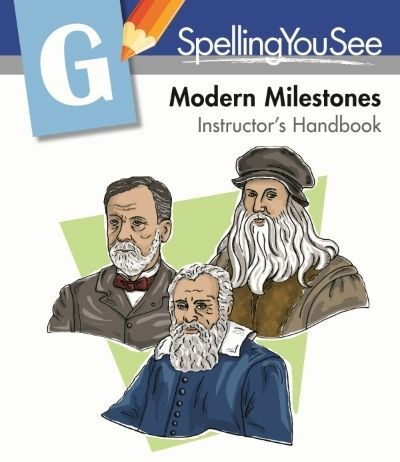 The Review Crew had the opportunity to review Spelling You See this spring with two level options, Level F, Ancient Achievements or Level G, Modern Milestones. The excitement in my house when Liberty got her box with Modern Milestones was awesome. Getting excited about spelling is pretty easy with Spelling You See. We ditched our current curriculum and Liberty dove into Modern Milestones with excitement not seen before about any subject. She’s a pretty decent speller anyway, but this was super fun for her and she’ll most definitely be completing this whole set of books this summer and fall. 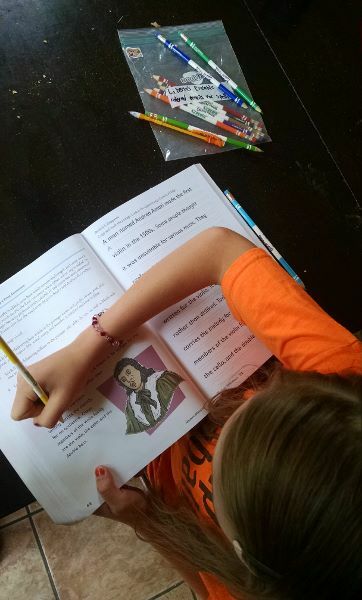 She’s determined it’s fun enough to work through the summer and not having spelling this fall – if not, it’ll give her a fabulous head start. 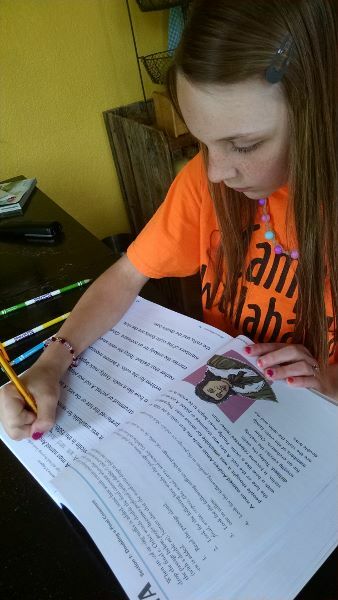 Liberty has just finished sixth grade and dove into Modern Milestones with confidence. She received two Student Workbooks, part one and part two, and a set of erasable colored pencils that she promptly guarded with labels and ziplocks, she loved them so much. I received an Instructor’s Handbook which, thankfully in my world, was needed very little. The concept Spelling You See uses was introduced and help was offered, but for the most part, Liberty could work entirely independently. For this busy momma of many, this is just what I needed. 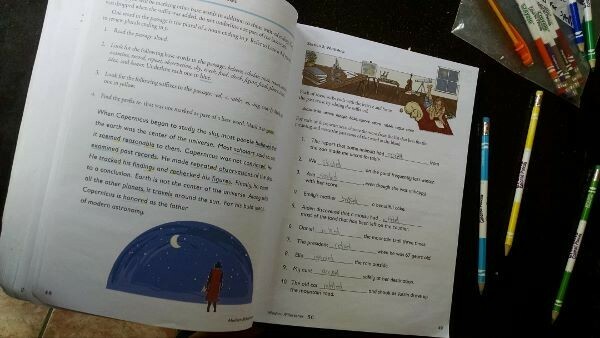 I was surprised to learn there are no spelling tests, no word lists… but when I mentioned this to my sister who uses a younger level from Spelling You See for her boys, she said they don’t have lists or tests for that level either. I was surprised. As much as I don’t want to do public school at home, no spelling tests?! The further Liberty went through Modern Milestones learning much of prefixes and suffixes and how words are put together though, the more tests seem like an inaccurate judge of how much she has learned. I hate the idea of studying for a test merely to pass the test without actually learning anything, and I recall so many times that my children have gotten words wrong on a test that I know they knew how to spell. How about learning to spell words by using them, checking over then yourself, and copying them carefully? I think Spelling You See is on to something here. 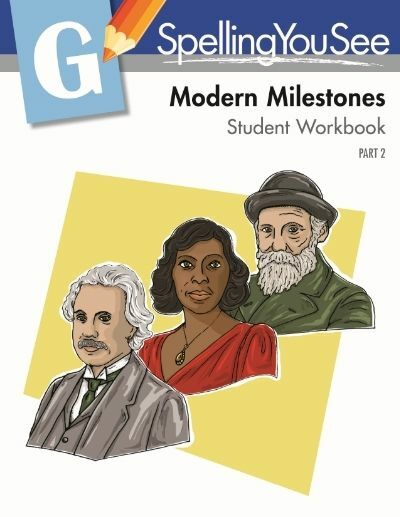 Modern Milestones contains 36 lessons with five parts each. We work a four day school week at home since we have co-op on our fifth day, but Liberty chose to do it five days a week and do it in the mornings before co-op. She loves part C (the third day’s work each week) best but states she has to keep it to one section a day or her hand cramps from much writing. She tried doubling up and doing spelling less days each week but found that too much for her muscles to take. When I asked Liberty if she loved Spelling You See, she responded, “Yes. A lot.” This book gets high regard from Liberty in both technique, learning of things as she worked with the words, and the pictures that explained what she was reading about. 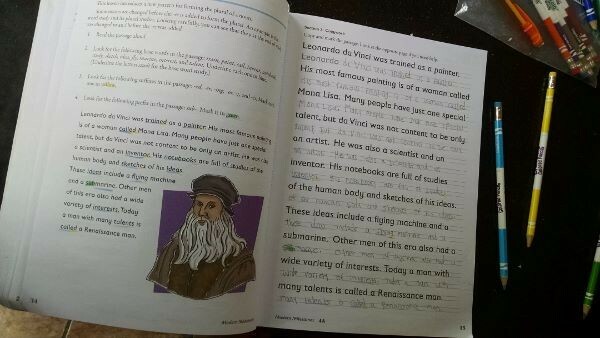 She learned of Leonardo da Vinci, Jan van Eyck, Johann Gutenberg, Botticelli, Copernicus, and Michelangelo so far as she copies down articles and marks paragraphs about what these artists did. (They’ve all been men so far, but eventually women are also named and discussed. Musicians and scientists are coming up soon too.) With a little bit of history and interesting articles about lives lived, Liberty thoroughly enjoyed this and learned much more than just spelling. I’m pretty sure this has been helpful for handwriting practice too. School after we’ve finished and taken a break for the summer is typically hard. I have to prod and encourage and remind and it seldom is picked up without much reminding. 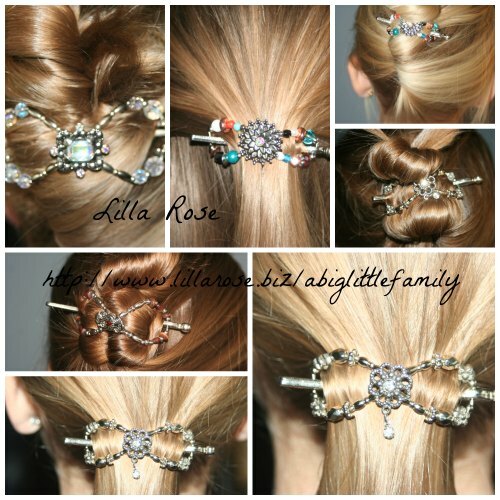 This… not so much. Liberty is right on track for the weeks she’s spent on Spelling You See and hasn’t been reminded even once. She just loves it and gets excited about it every day. I’ve yet to have any of my children get excited about any subject this much. I’m in a serious inner debate over switching everyone to Spelling You See after watching how much fun Liberty has had with it, even though I’ve already purchased next year’s curriculum of what we’ve always used. Spelling You See may just become a game changer for us. The Student Pack, including books part 1 and part 2, along with the erasable colored pencils Liberty loves so much, can be purchased here for $30. The Instructor’s Manual, while small and to the point, is entirely helpful, particularly when the student has a question, and it is available here for $14. 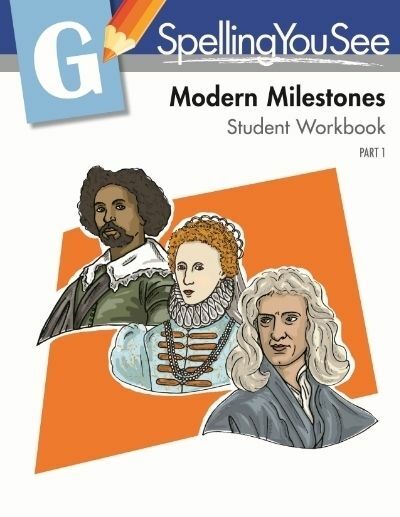 Two levels of Spelling You See were reviewed, Ancient Achievements and Modern Milestones. You can read what others thought of both at the Review Crew Blog. WE also use Spelling You See. We unschool but my kids wanted a spelling curriculum. They are on the second book B. Part 1/Part 2. I LOVE no spelling tests. We don’t test anything in our home.They basically just have words they spell from dictation in the books we are on. Part 1 anyhow.Each week they add more words, but some words are repeated. Right now my son is on Part 2 of book 2. The first few days he can do himself…underlining vowel chunks and copy work. At the end of the week he is now writing whole sentences via dictation. You are supposed to help them if they are struggling. It’s not a test:) For instance they should always ask if something starts with a “c or K” if they don’t know. Spelling You See also only recommends spending 10 minutes a day on the pages. So far my kids like it enough. I want to point out Spelling You See’s philosophy is basically you learn to spell by spelling. I agree with their sentiment that there just are too many “rules” in spelling that are more often than not broke. I would say this is similar to learning to read by sight vs phonics. You learn to spell by repeatedly seeing and spelling and coping the same words/passages. We have the same philosophy about math, reading etc. So glad you’ll like it!